Everything was absolutely amazing at the crab station! We went kayaking and did some shopping at the shops afterwards, and treated ourselves with some crab bloody Mary’s, beer, crab bisque, and of course crab! Everything was absolutely amazing, my mouth is watering just talking about it again! We had local Dungeness crab and my cousin had snow crab, all so delicious, you didn’t even need butter! It was recommended to us on the ship to try & that we did. It was fantastic to sip on one of these by the fire pit & watch the seals play in the ocean. Roll up your sleeves, you get to cook! The event started out with the cook/chef preparing & serving a few salmon items. From dip, to sliders to cakes. Recipes were proved to us. Then we got to season a single serving of both cod & salmon from a variety of seasonings provided. Out to the open grill we went. We were watch closely so we did not overcook our fish. Canned salmon is also available for purchase. We LOVED this experience!!!! We have three kids ages 8, 10, 12 and even they just loved it! She us so knowledgable and creative and the food quite good. We would highly recommend this experience. Yummmmmm!!!! We, of 3 generations, had a wonderful time. Dotie is very congenial and shares her experience in Hoonah with great pride. Her recipes are tasty and practical. She can filet a fish better than almost anyone! The facility is beautiful and the experience of cooking your halibut and salmon over an open fire is fun for all ages. Mary is also very helpful. We, of 3 generations, had a wonderful time. I enjoyed this one hour show. This is a small town and learning about their traditions and culture made for a lovely day. I appreciated that it wasn’t too expensive so we could feel good about only an hour long show. Good job! The dancing and story telling was amazing. A show not be missed! The dancing and story telling was amazing. The lighting added to the atmosphere and it was a show that should not be missed. Wonderful costumes, dancers, story telling..So much fun, well worth it. Wonderful costumes, dancers, story telling. My cousin went on stage to become a ‘wolf’ who was being wooed by Raven. So much fun, well worth it. Tour gives an insight into the local native culture, history & traditions. Went on a cruise excursion Walking Ancient Oceans and rainforest. Hosted by Jeff Skaflestad what was supposed to be a 1 1/2 hour tour turned into the most amazing 3 hour history and scientific talk we’ve ever experienced. My 16 year old son said he learned more on this excursion than in a whole year of school. Very reasonably priced, Jeff really delivers. You gain an insight into the local native culture, history & traditions. As well you learn much about the geological science of this area as well. 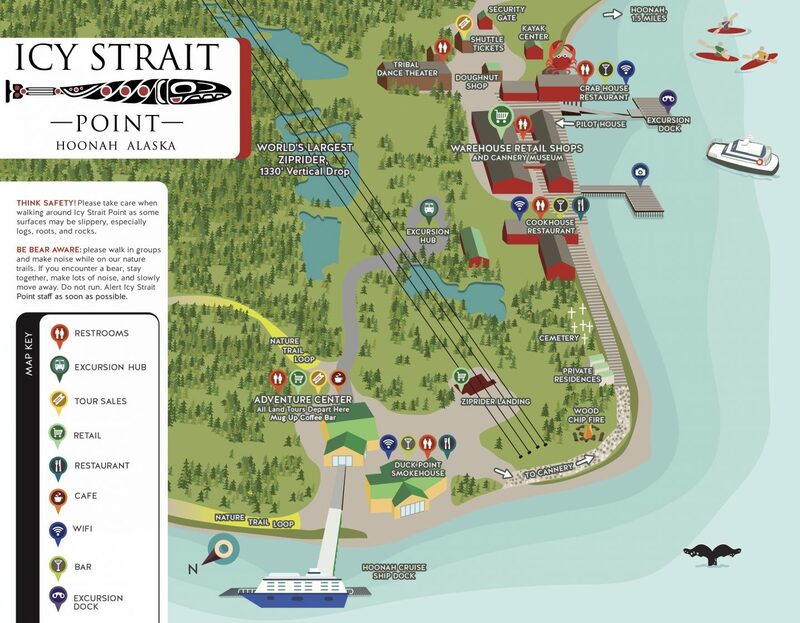 if your ship stops at Icy Strait Point...take this tour, its the best! Our tour guide Jeff was amazing. He is a retired School science/math teacher from the village. Jeff is a native of Alaska, who gained his upper education in the lower 48 and returned home to teach. He has a passion for nature/science and the land he occupies, and he is able to impart his knowledge and passion in a very entertaining way. If you want to learn about the connection that man has (or should have) with this earth, this is the tour for you. you will learn of how the land was created, how glaciers changes the landscape and continues to change it. Jeff will talk about the history of man in this part of the world and well beyond this immediate area. And you will learn what plants are edible one week and poison the next, how Lichen (that white moss on rocks) that causes rocks to breakdown, and why we must learn from the rain forests before they are gone. I have seen many tour guides before, and for years the best tour was the one at the Fredricksburg battle field. Jeff is now the top…. if your ship stops at Icy point strait. Take Jeff’s tour its the best.